The Textbook Commission originated in the early twentieth-century efforts of Governor Charles B. Aycock and other leaders to raise educational levels in North Carolina. In the beginning, only rural elementary schools came under legislative provisions for uniform selection of textbooks and only one basal textbook per course was authorized for use throughout the state. When high school textbooks were standardized, adoptions were initially at the county level. In 1945 the elementary and secondary textbook committees were combined to create a unified State Textbook Commission composed of professional educators. The size, composition, and duties of the commission changed over time, but the ultimate responsibility for issuing book contracts has rested consistently with the State Board of Education. Major changes have included the shift to an established adoption cycle, the inclusion of lay members, multiple adoptions per course, and more freedom of choice at the local level. In 1977 the size of the State Textbook Commission was increased to 14 members; in addition to 12 educators, 2 parents were appointed. By 1990 criteria for suitable textbooks were being issued by the state superintendent of public instruction with the aid of the Curriculum Review Committee, and regional textbook evaluation advisory committees were assisting the State Textbook Commission in its work. In 1999 legislation expanded the membership of the commission to a total of 23, including 15 educators and 8 parents. Modifications in law and policy have resulted in the present-day system, which permits local flexibility in textbook choice while maintaining a statewide course of study for all public schools. Allison W. Honeycutt, "Textbook Development," North Carolina Education (February 1936). Claude C. Warren and E. Michael Latta, The Origin and the Development of the North Carolina Textbook Commission (1990). North Carolina Textbook Adoption Services official webpage: http://www.ncpublicschools.org/textbook/. "North Carolina Textbook Commission, 1967" Johnson C. Smith University Archives. http://www.flickr.com/photos/23167301@N03/2218274313/. Ritter, Joel. 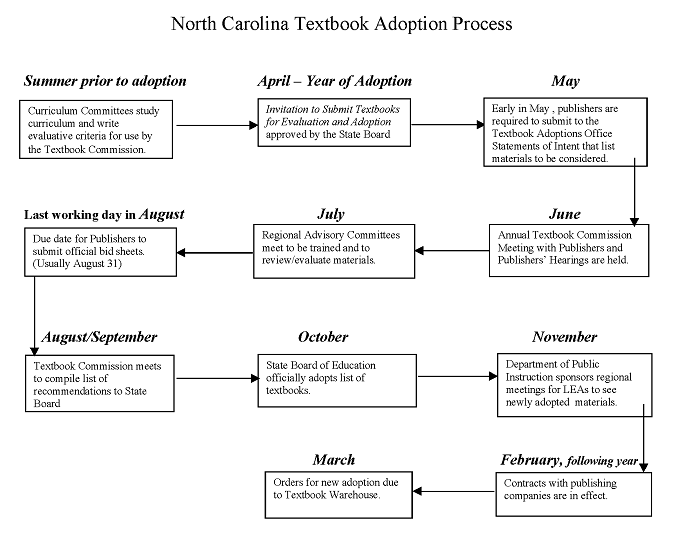 "North Carolina Textbook Adoption Process," Textbook Adoption Services, Department of Public Instruction. http://www.ncpublicschools.org/docs/textbook/process/schema.pdf (accessed May 24, 2012).